The Evolutionary Choice: "Power With" or "Power Over"
This video examines three visions for the future of humanity. The first is a "power-with vision," in which people get power by working together. This is characteristic of democracies with a "little d." It is also characteristic of societies that manage their inevitable conflicts effectively. The second is a "power-over vision," where people get power by inflicting their will on others. This is characteristic of autocracies. These tend to be violent, and torn by conflict. Lastly is the "powerless vision" or anocracy in which no one is in charge, and the ability to resolve conflicts and solve social problems is nil. Guy argues here that we are at a crossroads where we could easily go down any of those paths. If we choose either of the latter two, it is not clear if it will be possible to ever get back. This is Guy Burgess. For this post, I want to explore what we see as three visions for the future of humanity. On the one hand, there is the "power-with" vision. There is also a "power-over" vision, and something that we are calling "powerless" vision. These ideas are the logical outgrowth of looking at conflict in a complex, evolutionary, ecosystem-oriented way. They are also ideas for coming to grips with the chaotic nature of complex conflict ecosystems with their multitudes of independent actors, each pursuing their own self-interest, using all sorts of different decision-making rules in different environmental conditions. This seems, at least on the surface, to be utterly unpredictable. Still, this chaos doesn't have to be hopeless. I've always been fond of one of Kenneth Boulding sayings, "While we need to be prepared to be surprised about the future, we don't have to be dumbfounded." The truth is that, within the chaotic nature of social evolutionary processes, one can identify three broad evolutionary tracks within which all of this chaos might play out. And, it matters a lot which one of these tracks human society ultimately pursues. On the one hand, you have the "power-with" track where everybody has power from working with one another. With the "power-over" track you will have people fighting to see who has power over whom. And then there is the powerless track (which is represented with a negative image of the invisible hand of the power-over track), which is pretty much the exact opposite of power over. In the powerless world, practically nobody has the ability to influence events. As we see it, there is a pretty good argument to be made that we now stand at a great evolutionary juncture in which human society (or, at least, large chunks of the world) could go down any of these tracks. One option is for society to go down the "power-with," democratic track. In this context, we are not thinking of capital "D" Democracy as it is practiced by the United States or advocated by the Democratic Party in the U.S. We are talking about what is often called a small "d" democracy – the democratic ideal--which hasn't been realized in many parts of the world for very long. I've always been fond of the last line of Abraham Lincoln's "Gettysburg Address" which defines the democratic ideal as a "government of the people, by the people, and for the people." This is a way of organizing human society that's governed by Adam Smith's "invisible hand" where there is still lots of competition and conflict, but that conflict is channeled in a way that, in the aggregate, advances everyone's interests. Again, this is not the kind of democracy we are purusing in the United States, at the moment, which is, now, very much a power-over struggle with terrible political infighting. Rather, here, we are talking about democracy as we hope it would be... "government of the people, by the people, and for the people." Another path that society could easily go down is something we call "power-over" autocracy, where society is simply an arena where people fight for power over one another. This is a world in which, ultimately, some all-powerful tyrant emerges and controls the entire society. When we think about autocracy, folks my age invariably think about the 20th century's great tyrants: Hitler, Stalin, and Mao. Still, tyranny in the 21st century is likely to be different. New information technologies combined with a better understanding of the complexities of human thought processes are likely to create whole new forms of political control. This RAND report is a bit of a window into this. It's called "The Russian Firehose of Falsehood Propaganda Model" and it describes the sophisticated way in which Vladimir Putin is trying to exert control over Russian society and, to a substantial degree, control over other societies as well. There is another possibility, something we call the powerlessness track, which arises when we get to the point where there is neither the authority structure, nor the collaborative ability, needed to act on any of today's big problems. There is just anarchy and lots of pointless fights. This is the negative image and the antithesis of the invisible hand. Perhaps the most famous statement of the reality of this kind of world is from Thomas Hobbes and the Leviathan where he talks about the state of nature or pure anarchy where life is "...poor, nasty, brutish, and short." Certainly this is not the sort of life I aspire to for myself, my children, my grandchildren or anybody else. Still, this kind of society is a real problem in today's world. The Fragile States Index lists societies around the world that either are, or are close to, becoming failed states. These are places where where the ability to manage the Commons for the common good have all but disappeared. It is also important to remember that these are not absolute categories. They are connected by three intersecting continua that can be graphically represented as a triangle with democracy, autocracy, and anocracy in each corner. This triangle can then be used to map different situations and different human conditions in different places. Take the today's Middle East, for example. Every description I've read of the region leaves me with the impression that it's teetering somewhere between autocracy and anarchy with very little in the way of democracy. So, how can folks in that part of the world change things so that they can have a more livable future? In the United States, we find ourselves a long way from the ideal of a democratic society. If you look at the almost total dysfunction of Congress and the Executive Branch, it seems as if we are somewhere along the continuum from democracy to anocracy with with enough very powerful people around that we have some aspects of autocracy as well. 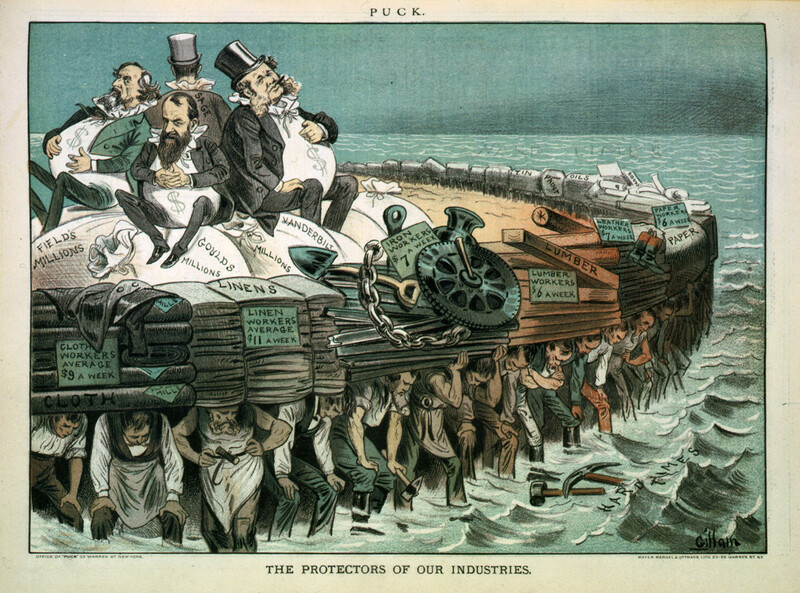 Another example looks at the Gilded Age in the late 1800s when robberbarons ruled the United States and you had something between democracy and autocracy. There is now a pretty strong argument to be made that we are in a second Gilded Age where oligarchs and the superrich exert enormous levels of control (fortunately without the violence that tends to accompany pure autocracies). The bottom line is that we are a long way from the ideal of democracy. You can look at this question historically in terms of the number of people who lived under each type of governance regime over time. The Our World in Data Folks ( https://ourworldindata.org/democracy/) have put together this website, which I recommend, that has all sorts of interesting timeseries data on the way in which people have lived. This data makes it clear that, historically, the threads of democracy, autocracy and democracy have weaved their way back-and-forth through social life. There are societies where things look good for a while and then they start falling apart and then they recover only to deteriorate again. The question now is, is that going to continue? Or are we really at some sort of fork, where if we go down the path of autocracy or anocracy, we may never be able to get back. One of our fears is that high-tech tyranny might really be unshakable. When you combine George Orwell's vision of autocratic rule with the potential for social control embodied in a neurobiology-based understanding of the way people think, and "total information awareness" technologies you get something pretty scary – scary enough to make me believe that if we go down the autocratic route this time, we may never get back. It is also quite possible that the missing hand /powerlessness route may also be irreversible. Here the big fear is accumulating Tragedies of the Commons. I found that the image I presented in an earlier post (global carbon emissions being equivalent to an annual forest fire the size of Africa +40%) illustrates the problem and is just one example of areas in which human society is devastating the Commons on which we all depend. In the absence of a power-with system (or even a power over system) to manage the Commons, we could easily damage it to the point where it will be extremely hard to recover. It's also doubtful that the predatory elites will save us (because they also depend on the Commons). They can just move to little islands of wealth and power amidst a sea of destruction and chaos. So, our top priority has to be figuring out how to make a power-with society work. And, that's the focus of this entire seminar. As the last slide in this post, I thought I would highlight a new book by Thomas Ricks who, as he has been trying to understand our time, decided go back and look at the lives of Winston Churchill and George Orwell in their fight for democracy and what was previously its darkest hour--the Nazi conquest of Europe and the rise of the 20th century's great tyrants. The thing that Ricks found so moving about Churchill, for example, was his ability to call people to action in times of danger, while offering no illusions about the difficulty of the challenge or the time it might take to prevail. This is a lesson we need to learn. We need to realize that we have no alternative but to figure out how to make a power-with world work. And we need to recognize the seriousness of the problem and engage. The goal of the seminar is to explore a large number of ideas for realistically addressing that very problem. Adam Smith. The Wealth of Nations (1776). Christopher Paul and Miriam Matthews "The Russian "Firehose of Falsehood" Propaganda Model Why t Might Work and Options to Counter it." Rand. 2016. http://www.rand.org/content/dam/rand/pubs/perspectives/PE100/PE198/RAND_PE198.pdf. Accessed June 10, 2017. Fund for Peace Fragile States Index. http://fundforpeace.org/fsi/; also http://fundforpeace.org/fsi/2017/05/14/fsi-2017-factionalization-and-group-grievance-fuel-rise-in-instability/. George Orwell. 1984. Secker and Warburg, June 1949. Garrett Harden. "The Tragedy of the Commons." Science. 13 Dec. 1968, http://science.sciencemag.org/content/162/3859/1243.full Accessed June 10, 2017. Thomas Ricks Churchill and Orwell The Fight For Freedom. Penguin Press. 2017.